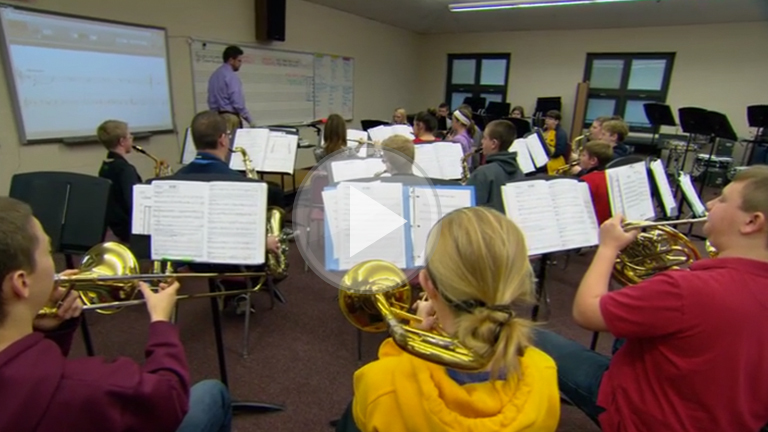 See how Mr. Kelsey provides timely and effective feedback in his classroom. Perform Chromatic March with accurate pitch and rhythm. Identify incorrect notes and rhythms within a performed exercise. Identify and demonstrate proper breathing technique in exercises and music. 1PR - Perform a varied repertoire of music, independently or collaboratively representing diverse genres and cultures and showing expression and technical accuracy at a level that includes more advanced ranges and changes of tempo, key and meter. 2PR - Perform, independently or collaboratively, with good posture producing an appropriate tone quality. 5PR - Read, write and perform rhythmic (including dotted rhythms) and melodic patterns in a variety of meters. 7PR - Demonstrate and use technology and media arts to create, perform and research music. 1RE - Apply multiple criteria to evaluate quality and effectiveness of personal and selected music performances and compositions and identify areas for improvement. How do Mr. Kelsey’s students respond to the feedback they are given? How does Mr. Kelsey encourage peer feedback and self-reflection? How does an environment like this lend itself to measuring student growth? How do you incorporate technology to enhance your ability to provide effective feedback to students? How do you use questioning techniques to help students learn and reflect? What will you do to promote an environment that teaches students how to provide and be responsive to feedback? How will you use feedback to motivate students to achieve their personal best?